Abstract: Lasers have quite a few reasons to prefer not too high ambient temperatures: spectral broadening, population of the lower laser level, thermal conductivity, thermal quenching, mode or standing-wave overlap requirements, and material issues. There are some cases, though, where some amount of heat helps. In solid-state gain media, high temperatures (high T) lead to a stronger excitation of higher-lying sublevels within Stark level manifolds. In this way, they often “smear out” the gain spectrum, and they may also increase the lower-level population (in quasi-three-level gain media), thus reducing the peak gain and the gain efficiency. Similar effects occur in most semiconductor lasers, where the Fermi distribution is smeared out. The thermal conductivity of solid-state media often gets lower at higher T, thus further increasing the peak temperatures as well as the temperature gradients, with all the consequences such as stronger thermal lensing, stronger mechanical stress, etc. 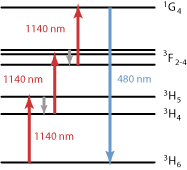 If there is an intermediate energy level not too far below the upper laser level, high T can favor multi-phonon transitions, thus eventually quenching the upper-state lifetime. 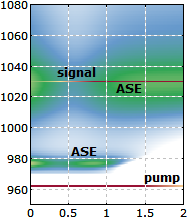 Particularly in VCSELs, high T can cause a mismatch between the intrinsic gain maximum and the spectral position of the closest cavity resonance. This can strongly increase the threshold pump power. Even for VECSELs, usually having closely spaced cavity resonances, a problem can arise from a mismatch between the standing-wave pattern (for the wavelength of maximum intrinsic gain) and the position of the quantum wells. Some construction materials of the laser head may be damaged at high temperatures. But as it is with human beings, a few lasers like it hot. For example, they may require certain thermally activated effects for efficient operation. Also, VCSELs and VECSELs may be designed to have an optimum overlap of the standing-wave pattern with their quantum wells at a higher temperature. Strong cooling (cryogenic operation) can also reduce the gain bandwidth, which may be detrimental in some cases. So most like it cool, but a few don't.